The luncheon was a chance for faculty and students to share the great work they’ve been doing all year to encourage healthy behaviors on campus. One of the presenters was Mr. Salaheddine Ziadeh, Psy.D, staff Counselor at OSU’s Counseling & Psychological Services. Salaheddine talked about their stress management programs for students which focus on reducing stress on campus and increasing resiliency to stress on campus. He also talked about the OSU Mind Spa. Ahhh… you couldn’t help but feel relaxed just hearing about this unique sanctuary. The Mind Spa is open to anyone on campus and is a place where you can soothe your mind, body, and spirit. If you find yourself on OSU’s campus, I highly encourage you to stop by the Mind Spa and indulge yourself in one of their relaxation or meditation services. Fresh from the Faucet – Did you know that you could save more than $400 over the course of a school year if you chose to drink water as your number one beverage while on campus? This innovative campaign encourages students, faculty and staff to save money on sugary beverages and take a step towards better health by putting water above all other beverages. 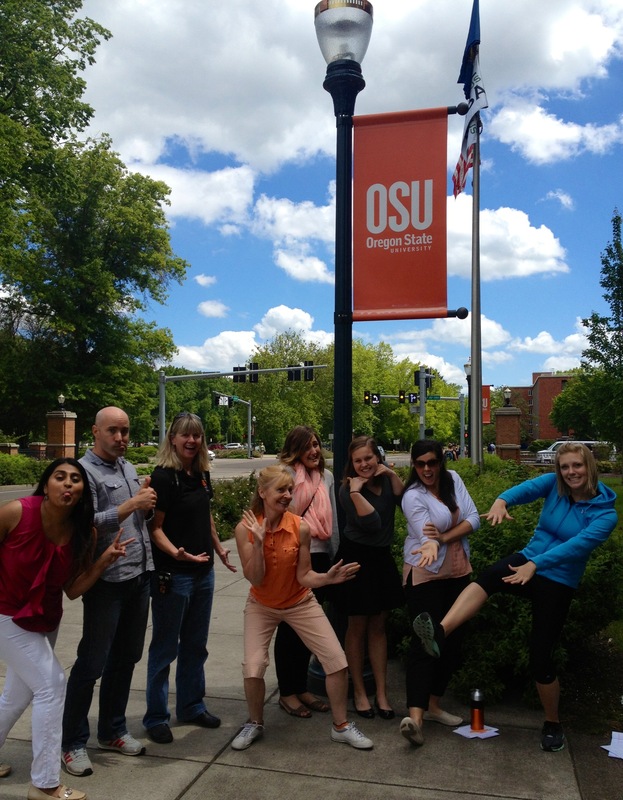 The folks at OSU understand that making healthy changes requires creativity. 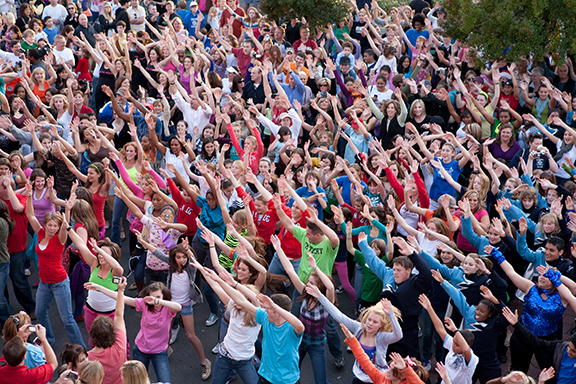 With that in mind, they used “Nutrition Flash Mobs” to gain awareness for healthy eating. Fruit and Veggie Flash Mob –Students, faculty and staff from the College of Public Health and Human Sciences, the OSU Elite Dance Team, and employees across campus were part of a Nutrition Flash Mob. After the dance, students and staff members passed out free fruits and vegetables, as well as coupons, as a way of advising students of the importance of eating fruits and vegetables, and encouraging them to eat healthy on campus. Smoke Free OSU – OSU went smoke free in the Fall of 2013 and has earned the ‘Gold Campus’ status for its smoke free policy. Beaver Strides – Celebrating its 10th year, Beaver Strides is a physical activity program that has something for everyone. Whether you’re just getting started on improving your physical fitness or you’re a seasoned fitness vet, they have a program for you! Hearing the stories was great, but my favorite part of the event came when OSU’s Dixon Recreation Center led us in a ten minute Zumba lesson half way through the luncheon. As an avid runner with little (very little) coordination, I realized I might benefit from adding in a little dance or Zumba moves to my daily workout. Thank you to the folks at OSU for all the incredible work they’ve done to make Oregon State’s campus a healthier place. We’re so proud to support these initiatives as part of the PacificSource Healthy Life Initiative™. For more information on OSU’s Healthy Campus Initiative and Be Well. Be Orange, check out their web site at: http://blogs.oregonstate.edu/bewell/. Come on, am I really required to buy health insurance? I like this! I want to attend more meetings that include a 10-minute Zumba break.